Good old Teddy has a ton of quotes attributed to him. The 26th president of the United States was a man of many words and big actions. 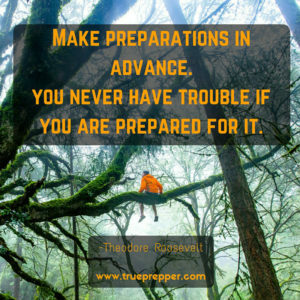 This example is not one of his more known quotes, but hits a chord with preppers since he is bluntly advocating the importance of being prepared. Carl Sagan was an American astronomer with a ton of quotable sayings. His love of discovery and learning was infectious. He dazzled a whole generation with his book and series Cosmos about the vastness and wonder of space. This quote is an example of how fragile and rare life is in our universe. 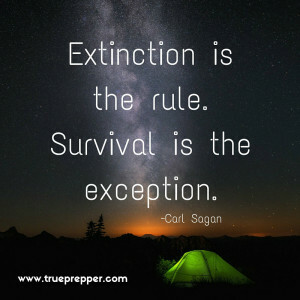 As preppers, one of our goals is to sustain it as best we can on our tiny little blue ball of a planet. A Scottish born scientist, engineer, and inventor most known for his invention that nobody can peel their eyes from these days, it seems. This quote is not one of his more known since he has a large catalog of quotes attributed to him. Bell had many other inventions besides the telephone, including a wireless version called the photophone, the metal detector, and hydrofoils. Of course another president made the list! 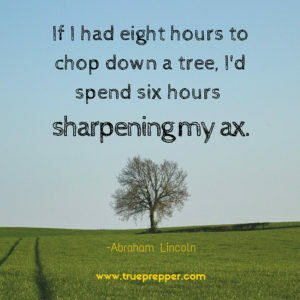 Abraham Lincoln has a storied history with axes, starting using them at a young age to build cabins. He used one not a week before he was assassinated as well – demonstrating to young soldiers how to split wood. Truthfully, if I had eight hours to chop down a tree, I would get the chainsaw and have a little over seven hours to enjoy a cold beverage afterwards. 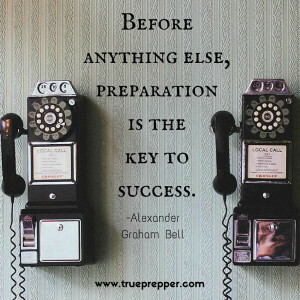 The quote does show the importance of preparing though, which we can all appreciate. The great horror author writes for a living, so there are sure to be some good quotes. 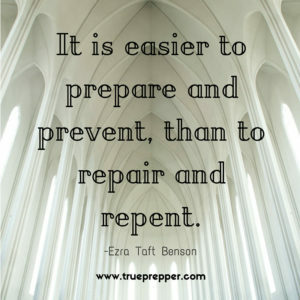 This is one of the more popular prepper quotes that helps ‘clear the air’ for many preppers. 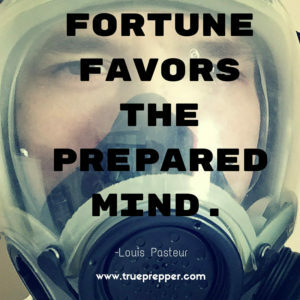 Some that do not understand the importance of being prepared for emergencies try to say that preppers look forward to SHTF and wish it would happen. 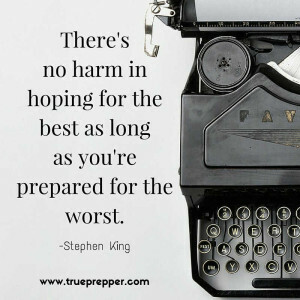 This quote helps us beat that twisted logic and shows that being prepared for the worst is not the same as hoping for the worst. A renown French chemist and microbiologist kept busy by discovering fermentation, the principles of vaccination, and inventing pasteurization. A great runner up quote for Pasteur would be “My strength lies solely in my tenacity.” As far as prepper quotes go, this one is hard to beat. The general was an Olympian in his early years, and busting up Nazis in his later years. This quote highlights the importance at looking at past events to see how others have coped. Learning from our past is an important step to not repeating the same mistakes and not being caught off guard multiple times. If Benjamin Franklin has his way, the turkey would be the United States bird instead of the bald eagle. We expect Thanksgiving would have looked much different. 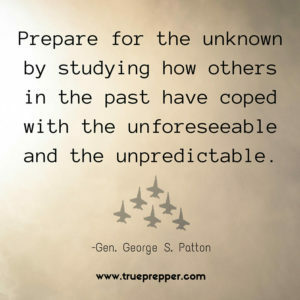 This quote is a favorite among preppers, and is fairly straightforward in how it presents the alternative to prepping in black and white. Benson was a farmer, government official, and president of the LDS church. He has written many books on the government and Mormonism, providing a large amount of quotable material. This quote is concise and catchy, showing Benson’s wit and eye for writing. Another US president caps off the list of quotes with a great analogy. 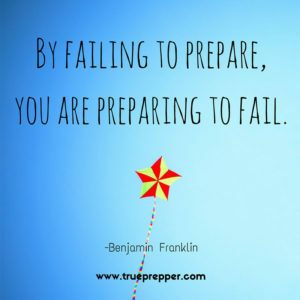 Prep before the SHTF- do not wait until disasters and emergencies are on your doorstep. 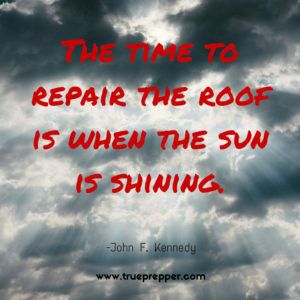 We hope you saw some new prepper quotes from this list that maybe you haven’t seen before. There is a mountain of prepping quotes out there, so reply with any that you think we left out. Also, feel free to share, print, or pin any of these quotes or images to motivate yourself or people you are close to. If you really need to kick start your motivation level- try a new hobby related to prepping. Here is a good list of hobbies to try out for starters. Stay safe and stay motivated.